They are very responsive and professional. I will definitely use them again. This company was great. My heating system was completely destroyed after Hurricane Sandy. They got me a new one up and running in record time. I was very impressed and grateful at how quickly they were able to get it all done given the magnitude of the crisis. The even came back quickly for a minor adjustment that was needed. Communications were also courteous and responsive. Thanks for making a difficult situation easier. Thank you for sending Miracle plumbing. I would like to mention, they did a great job. The plumber that installed my water heater was very polite, personable and he even cleaned up. He did an amazing job. Thank you again. I want to thank you very much for helping restore our heat to our home in Long Beach. The crew worked over 12 hours on the day before Thanksgiving in my freezing basement. When the boiler wouldn’t fit they put their heads together and came up with a solution.. They were perfect gentlemen and did such a professional job. I would recommend your company to anyone! Thank you again!! Just wanted to say thanks for the work you guys did. Your technician came by last week and he was great. Very honest and informative. Definitely will recommend you guys to my friends. Kenny from Miracle Plumbing replaced a valve on my water heater, drained and cleaned same quickly and I’ve had no problems since. Will definitely hire again and I have recommended to others. I have been using Miracle Plumbing & Heating for all of my plumbing needs for a couple of years and I have been very happy with their work. I own rental homes and Miracle has installed boilers, 3-zone heating systems, and any other plumbing or heating need I’ve come across. Some of the homes I own are used by Social Services and some are not left in the best shape when the tenants move out. Miracle Plumbing and Heating has taken everything I’ve throw at them and handled it beautifully. They are very responsive and professional. I will definitely use them again. The service technician did a great job at diagnosing my problem and corrected it quickly for a reasonable price. I would definitely recommend Miracle Plumbing and Heating as they are prompt, professional and easy to deal with! Ken from Miracle Plumbing & Heating was very user friendly and arrived on time for the job. He answered all of my questions and concerns in an excellent manner. There was a crew of three experienced guys who were also friendly and knew what they were doing. The job was difficult because it involved finding a broken water pipe under a cement slab. They located it fast and fixed it well with minimal mess for me to clean up. I think they are very professional, and very courteous. They were also very neat and cleaned up after themselves. They did an outstanding job. They were very punctual which says a lot about them. I would highly recommend them to anyone who needs any kind of plumbing work. I hired Miracle Plumbing and Heating to install a couple of new toilets in my home and fix a few leaky faucets around the house as well. This work was done in the summer of 2009 and I am very pleased with their work. Ken was a pleasure. He really knows his trade. He was quick and efficient. He actually finished AHEAD of schedule, which is rare with some contractors. Overall, it was a great experience and I would definitely use them again. They came the same day they called. They tried to fix the problem but my boiler was too old and the parts would have been too costly. They put in a new boiler the next week. They were neat and took the old parts with them. I decided to move my washing machine into a room I recently added onto my home. I did not have water lines in the area where I wanted to install the washer and dryer. Miracle Plumbing and Heating ran a hot and cold water line from the existing room into the new room. It was a pleasure to work with Miracle Plumbing and Heating! The receptionist was helpful and knowledgeable, and the plumber was courteous, professional, and very neat. I received an estimate and was able to have the work completed in the same week. 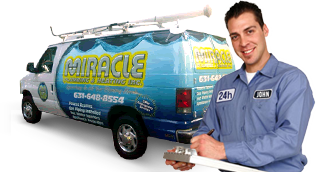 After receiving prior estimates, I found Miracle Plumbing and Heating’s price to be right. I was very happy with the high quality of work. I have recommended this company to my friends.